Dr. Donato is trained in Cranial Adjusting Turner Style, which addresses problems such as headaches, dizziness, sinus congestion, brain fog, and neck and shoulder pain by gently moving the bones of the skull. By delivering sustained pressure holds to the skull in the opposite direction of restriction, Dr. Donato is able to reset problem-inducing bones to their original, high-functioning state. 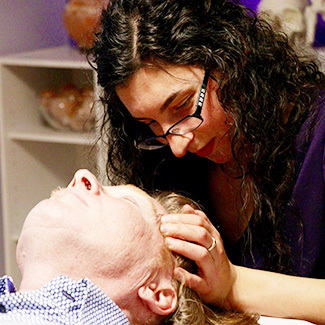 While some cranial adjustments can be tender, most are relaxing and provide immediate relief. Patients both old and new are welcome to utilize chiropractic cranial adjustments. During your consultation, Dr. Donato will provide a thorough explanation of Cranial Adjusting Turner Style and what it may mean for you. Current patients may schedule an extended visit with both a traditional adjustment as well as a specific adjustment focusing on the bones of the skull, and patients new to the practice may make an appointment consisting of a consultation and, if necessary, a cranial adjustment. Cranial Adjusting Turner Style falls under Well from Within Chiropractic’s extended visit appointments. These appointments will take about 15 minutes in total. During this time, Dr. Donato will hear from you, listen to your concerns, identify that source of your discomfort, and perform a custom adjustment to correct any faults in the bones of your skull. Each patient enters with a unique set of needs. Dr. Donato is pleased to work with you to devise a treatment plan that helps you reach your health goals. If Cranial Adjustment Turner Style sounds like something that might benefit you, contact our practice today.